When is a tea cup not just a tea cup? When it is used for something other than its original purpose or when it's made better. Today this little tea cup which normally has hot tea or coffee in it is holding fresh flowers and keeping me company while I dream. I'm dreaming in colors y'all! It's only February but I'm dreaming of garden gloves and fresh dirt. I'm dreaming of flower seeds, zinnias, roses, and sparkling water. We walk the lot everyday where our new house is being built. It seems to be flying up right now; though I know it could slow down at any moment. We walk around and envision boulders snuggling up next to moss and ivy. We dream of water features ... yes there's an s on the end of that word. We imagine evenings spent on the patio listening to the owls. We think of mornings looking out at the dogwoods and redbuds we will plant any day now. I have my eye on the perfect spot for a big ol' window box that I'll get the trim carpenter to build and can't wait to fill it to the top with flowers. For now my tea cup vase is holding grocery store flowers but soon...very soon...the flowers will come from my yard. 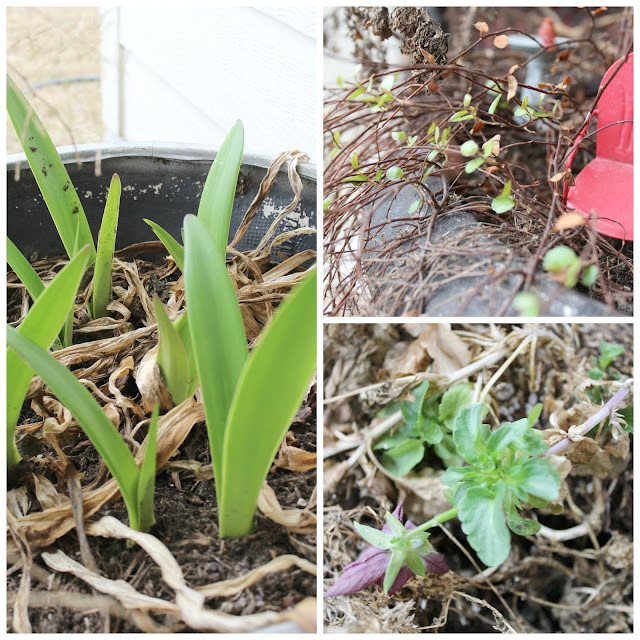 For now I see little tiny peeks of green in some of my flower pots and they let me know that the promise of spring is right there peeking through the dirt. That is so exciting, Stacey, to walk the lot daily and be able to see the angles of the sun and shadows. You'll have a spectacular garden and water features (with an 's'!). Your home is really coming along nicely Stacey and it is amazing on how quickly it went from being ground to a future home. 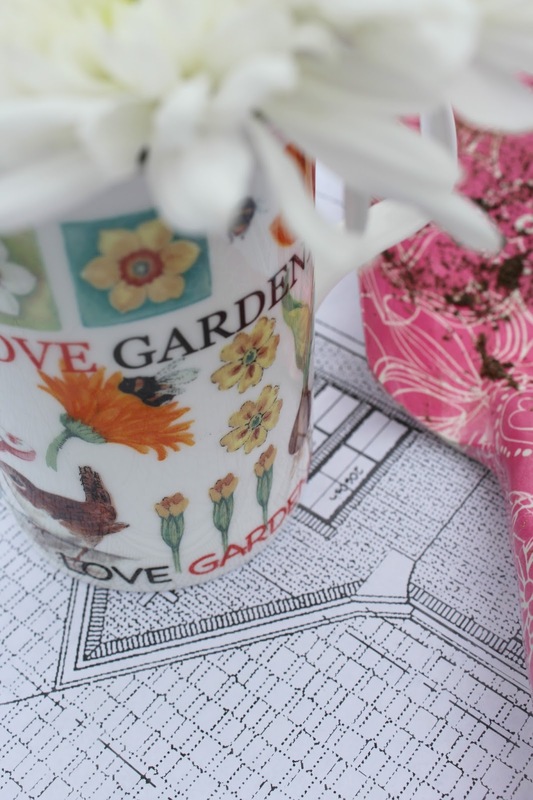 Your love of gardening and home will be evident in every detail! Dreams are a wonderful thing and even better when they become a reality. Thanks for joining our Tea Cup Party..
You can never have too many vases. Grocery store or hand picked from the garden. Using a teacup is a great idea. I'm thinking of the pretty little flowers that will be in bloom soon like grape hyacinth and crocus. Thanks for the inspiration. What a lovely use for a pretty teacup! How exciting to see the house go up and to dream of how it will all look! I know you are beyond excited! I am right there with you! For some reason I am longing for spring to get here faster than I have any other year. I play pokeeno and this month I won the prettiest garden tools and gloves. Sigh. I want to use them now! Presidents day is around the corner, so at least I can do a little pruning and clean up in the yard. Hang in there my friend! How fun that you get to plan what sounds like a beautiful new home for you and your family. I can't wait to see it! Stacey, I am so excited for you to see your home completed with beautiful landscape features. I am ready to dig in my little garden...Happy Weekend! I am envious that your house is going up! We still do not have our septic permit. The stupid county is sooooooooooooooooooooo slow!! I am dreaming of plants and trees as well. How I love this post, Stacey. The repurposing of a tea cup for something so special and all the hope that the future will bring when that cup is filled with flowers from your own garden. I know it will be just stunning and then, what joy! This is so nice, Stacey. One day soon you can look back on the picture of those grocery store blooms and realize the journey was as rewarding at the destination. Beautiful pairing of the flowers and tea cup! Thanks for sharing and best wishes on the building of your new home. Such an exciting time for you. Watching your new home's progress and envisioning your new garden. Enjoy the process. I am so excited for you Stacey that you can see the progress going on with your new home. Just think pretty soon all your dreams will be reality and you will be having a nice deck and water feature in your yard. Exciting time for you as you come closer to your dream home. Happy Friday. So excited for you, Stacey! Can't wait to see more of your new house and what a gorgeous garden you'll have at your new house. Love the teacup! Pretty post. I love hearing about and seeing your house progress. Fun to hear your gardening dreams too. I could stay outside all day it is so beautiful yesterday and today. So I've got to get out of the house and enjoy it. Dogwoods and redbuds speak to my heart. I love Spring and the grocery store flowers in your tea cup. Earlier this week I saw several pear trees beginning to bloom as I traveled from Mansfield to Dallas. My early daffodils are in full bloom. Sweet post Stacey! Can't wait to see your new build!! 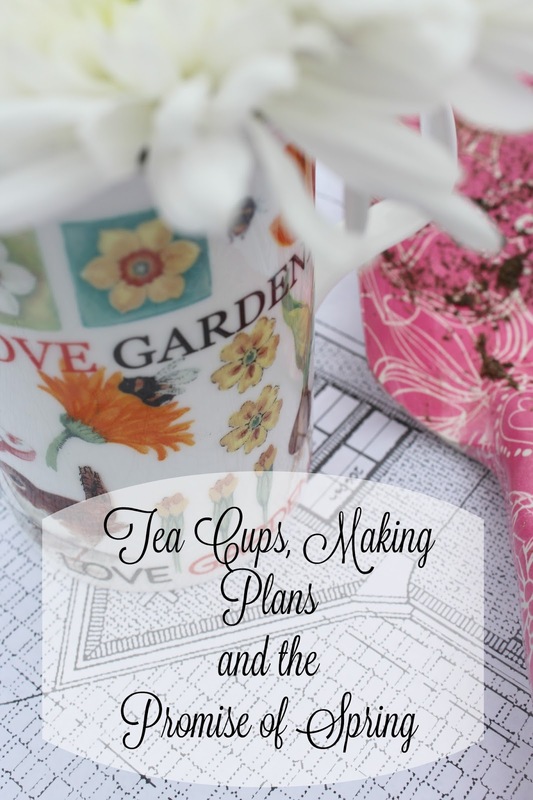 Love your cute teacup filled with pretty flowers! I too am dreaming of Spring! I have a feeling that it feels a lot more like Spring where you are than where I am! What an exciting time for you! Have a wonderful weekend, dear Stacey! I know it's hard waiting for your home to be ready. Can't wait till you move in! I am so thrilled for you about the house and I know you are excited about watching the progress...wanting them to hurry up and get it done! I love teacups and used to have a huge collection. I've pared it down quite a bit but still have some very special favorites. I like to use them for different purposes also, as I don't drink tea. Teacups seem to make everything a little extra special! Love and hugs to you!! Such potential waiting to come alive in your home, garden and yard! Looking forward to seeing all that you do. Thanks for visiting tonite. I love the flowers in the tea cup. I use tea cups as scoops in flour, sugar and stuff. I also put floating candles in them. And of course, I hang them from cup and saucer racks on the wall. it's therapeutic to dream the way you are, Stacey and focus on tomorrow...I did that with the lakehouse. And I'm so excited to get back to my gardening in May after 2 seasons of neglect. You are lucky that your workers can accomplish so much with your mild weather. Things come to a standstill in the winter months here. Can't break ground when its frozen! I look forward to your gardening...you are good, girl, and always inspire! You are going to have so much fun working on your new home, Stacey! How fun to dream and design what you want from scratch! It will be wonderful! When do you expect to be in the house? Things are moving so slow on the remodel of the house across the street from us. They began last August they did not tear the house down, they merely gutted it. 7 months later we are still looking at studs and wonder if it will ever be finished. You have a lot to dream about....a new home & a new garden! Looks like you will be in the garden soon ~we have a couple of feet of snow here now so it will be a couple of months for me. Thank you for your visit and have fun in your garden! p.s. I have been enjoying little glimpses of Texas through the famous Chip & Joanna! Feel free to come to my house if you want to plant flowers outside while you're waiting for your beautiful home to be ready! But really, I am in Houston right now and can't believe all the beautiful azaleas that are blooming. I love gardening and teacups, so the idea of combining the two is very pleasing to me. I no longer have much room to garden, but a few teacups full of flowers or seeds, and strategically placed is certainly doable. Great post! Spring cannot come soon enough for me, Stacey! Yours will come much earlier than mine. Hope you have a great week and things are going smoothly with your new house. Beautiful post, Stacey! I know that you must be so excited for your new home to be ready. What fun it is to walk around the property and envision everything. I hope that you have a wonderful week!!! I saved my zinnia seeds from last fall and I can't wait to put them in the ground. I know you will be thrilled to be in your new house. It sounds like it is going to be fabulous. It must be so exciting to walk your property Stacey, and imagine your home and gardens as they will be. So excited for you! I loved reading about your dreams for your new home, Stacey. Your last water feature was so pretty, and I look forward to seeing more than one in your new home. I'm dreaming of your water features too! Feel free to write a post about "noise reducing water features" as my neighbors are driving me crazy! 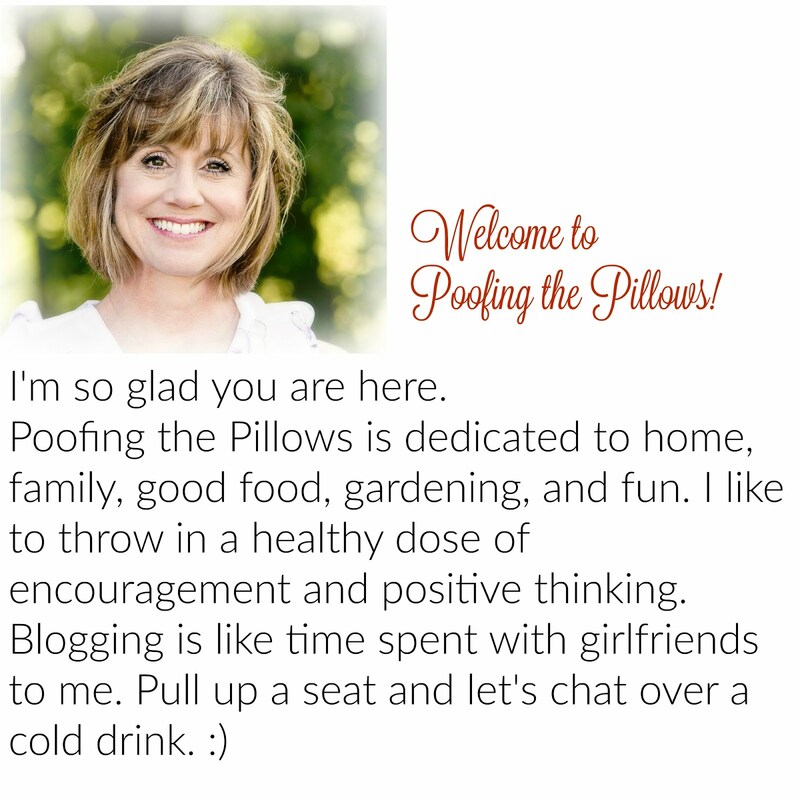 The beauty of blog friends is how like minded we are in so many ways. 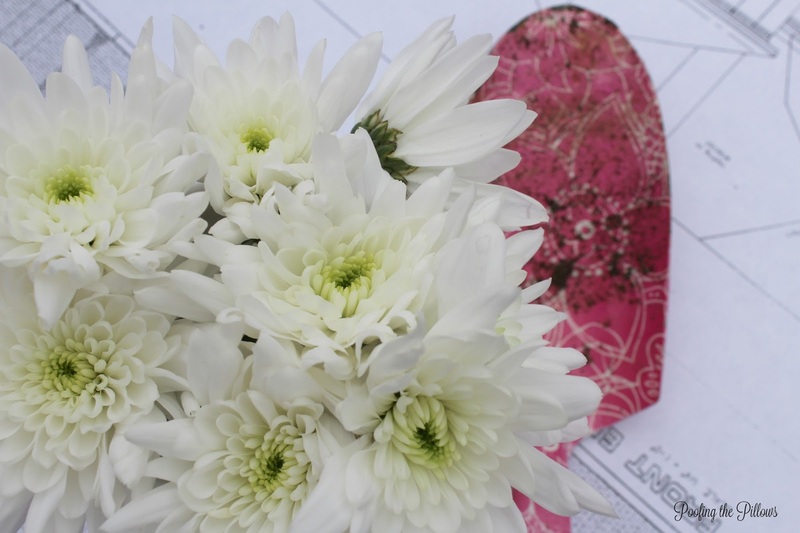 Oh how our February mindsets and blogs sing about the beauty of flowers! Stacey, building a new home is so exciting! What fun you are going to have. I'm dreaming in color as well and I have tulips on my kitchen table. Thanks for sharing with SYC. Oh, lovely. Spring is determined to make an early appearance this year. I need to start buying flowers and using them inside. Yours look so lovely in the teacup. How exciting to get to watch your new home being built. We have built two homes, and it's a lot of stressful work at the end, when the inside starts coming together and all the finishing choices are being made. Can't wait to see your new home!! Have a wonderful day!! 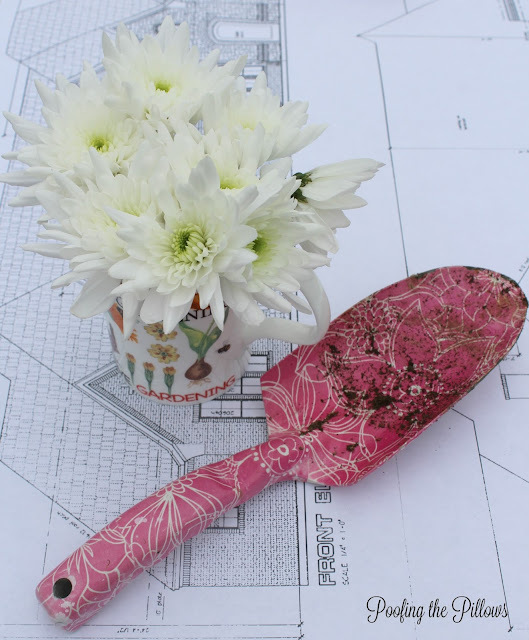 Stacey, How exciting to be planning for a new home. Congratulations! I know my Mom starts planning her garden at this time, what seeds to order and where she is going to plant them. Thanks for sharing. Sylvia D.
Oh How exciting to have all those dreams... you'll see your will be right there living them all in your new dream home very soon!! Good Evening Stacey, I can feel your excitement, whilst you write about your new garden. ... and how lovely to have all those wonderful green shoots peeping through the soil reminding you of things to come. It is so exciting to see your home being built.... that must feel so special. Enjoy your store bought flowers, because before you know it, you will be picking flowers from your own garden.... and not remember the time when you didn't.